I get a chuckle out of Mr. Olechowski flogging his relationship with the Polish Slavic Center. He does not mention that the PSC’s “meals on wheels” program is operated by the Bushwick Ridgewood Senior Citizen’s Council (READ: Vito Lopez and friends) or that his campaign manager was the (ostensible) leader of the “group” who were responsible for the shitshow regarding the Polish Slavic Center’s Cafeteria getting a license to sell wine and beer (they were against it). I can assure you, that whole affair was NOT about the right to sip suds. Oh yeah: here’s a fun question for Mr. Olechowski (given his claim to be an environmental activist): why wasn’t he at this meeting a few months ago? For Assembly district 50 – there is no Public Housing in Zip Code 11222. There are a couple of Non Development sites on Ash and Box. but that’s it. It is a great mystery why a bunch of people that think they are democrats blocked a homeless shelter using standard GOP scare tactics the other year. For course, just because they say they are Democrats, you and I know, actions speak louder than words. Male State Committeeman? Who’s running for Female State Committeewoman? Is this the kind of attention to detail we can expect from these jokers? “If you haven’t met him yet, I hope you will meet him soon.” Doubtful. I’ve never laid eyes on Chris Olechowski. Meanwhile Lincoln Restler came to my apartment because I signed his petition. Not saying that fact makes him a better candidate, but he certainly seems to respect all the voters. Well, there IS indeed a Male and Female State Committeeperson for each district. That is so counterintuitive to how American democracy works that I could not even imagine it to be correct. That or I’m just stupid. I still maintain that Male State Committeeman is, um, redundant. To answer your question really quick, Eric: Linda Minucci is running unopposed. As you may recall, last time around Kate Zidar and another woman whose name eludes me ran against Ms. Minucci. 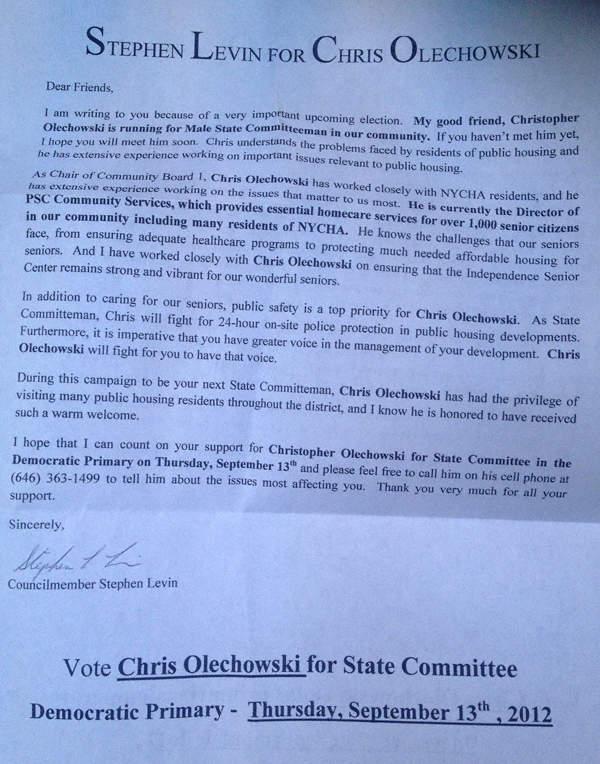 Why isn’t Christopher Olechowski (be it directly or through a third party) encouraging Greenpoint/Williamsburg residents to call him with questions? 1. Why are you claiming a leadership role in the fight against the TGE plant when there is ample evidence to the contrary that you had a titular role at best? 2. Will you consent to a debate with Lincoln Restler? 1. This facility is sited in a community which has a serious homeless problem. One which BRC did not seem interested in addressing. This of course has since changed. They are allocating 20 beds for our local homeless. I think this is great! 2. The lack of any dialogue/communication with the community, be it via elected officials, our Community Board, etc., on BRC’s part. If there’s one thing that will make the collective imagination of a community go wild, it is a sense of powerlessness coupled with a dearth of knowledge. BRC has (somewhat) addressed this by having some neighbors of this facility tour 400 McGuinness. That’s the good news. The bad news they did so after opening said shelter and not telling anyone— not our electeds, not our community board, no one. Here’s the deal: regardless of whether or not one is for or against this facility, he/she had the right to know when it was opened. This did not happen. Methinks the term I am looking for here is transparency. In closing— and I suspect you are not aware of this— but it is my understanding that Steve Levin’s office is (more or less) spear-heading/serving as a point-person(s) for the lawsuit aimed at fighting 400 McGuinness. Interesting, yes?